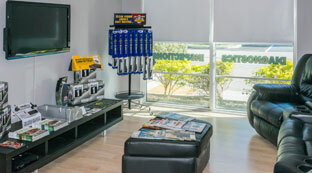 At The Car Clinic of Miami, we take pride in being unlike most auto service shops in the Miami area. The people who work here are honest, and our shop is clean, organized, and comfortable. We know that just a few minutes down the road you can shop around until you find the lowest price for a mechanic shop, but who knows what you’re paying for? Will you receive quality work, reliable service, and the right parts? With The Car Clinic of Miami, you don’t have to wonder—we’ll never try to sell you anything you don’t need, and we’ll go above and beyond to earn your trust. Our shop is ASE certified, and we’re qualified to work on all types of vehicles. We can handle brake repair, oil changes and any general maintenance on your car. With every service, we conduct a 27-point vehicle condition inspection to ensure your car is safe and reliable when it leaves our shop. "Most people simply don’t trust mechanics in Miami—and rightfully so. The majority of local mechanics don’t do quality work, and they try to sell unnecessary repairs. I want to change the negative perception people have of the auto repair industry by providing quality work and exceptional service in a clean, organized environment. I want my customers to think “wow!” (in a good way) when they walk in the shop, and when they leave with a well-running vehicle." In addition to providing honest, quality auto repair, we care for the community by supporting organizations like the Heavy Legacy Foundation. Our owner, Fernando, serves as South Regional Coordinator, and has been very involved for about five years. Our customers come from all over the Miami area, including South Miami, Hammocks, The Crossings, Country Walk, and West Kendall. 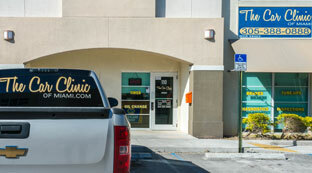 It’s easy to get to our shop—we’re located on the north side of the Tamiami Airport, just one traffic light west of 137th Avenue inside the Lucky Start Biz Center. Let Us Take Care of What Ails Your Car! We hope you’ll choose The Car Clinic of Miami for your vehicle’s upkeep, repairs, oil change, brake repairs and air conditioning service. Give us a call or contact us online today! Career Oppotunities in Auto Repair! 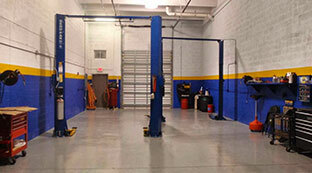 The Car Clinic of Miami is a respected business in the Miami, FL area with a strong customer base. We’re often looking for qualified, enthusiastic candidates to join our team, from entry-level office staff to apprentices to technicians. If you want to apply your skills in a friendly, high quality, family-owned automotive business, please introduce yourself. Contact us online through our website appointment form, give us a call, or stop by the shop to learn more about available positions and career opportunities.